39) Aiga's Revenge From the Soul!! No episode on December 31, 2018.
how can aiga defeat him just after getting his new bey !!!! it could at least end in a tie . aiga now does not have his dark resonance now . so when VALT battled the top bladers like free soon after getting a new bey he lost badly to them . but shu now is even stronger than free was then . Then how aiga defeated him just like that . this is just too much of plot armour destroying the PLOT !!!!! (Dec. 17, 2018 11:45 AM)Fusion core Wrote: SHU ......lost !!!! Kit is not a Ki"d"
Kit looks really cool, but why are we fighting Harts again? He lost, his arc is over, let him be already. Aiga was given zero closure on that arc. This fight fulfils that, and also serves as "a true bond is better than a dark bond" development for the overall story. I get your point but achilles breaking seems like a fine closure to me, and it kinda feels unneccesary to make him fight Harts again. I wouldn't be suprised if they have something prepared for the last 10 episodes and just need to fill some space in. I know what you're saying, but I still disagree; Achilles breaking resolved nothing. It swapped Aiga's approach towards his battles, but his resentment towards Phi and Hearts hasn't changed and was never resolved. This battle will get rid of Hearts within Aiga's plot line because he'll have proven his true way of battling is superior, and thus this battle is pretty necessary to happen. If not now, then it would've happened during the final tournament, but his rematch against Hearts is very necessary nonetheless. A rematch with Hearts is decided, and guests visit to Ranjiro and Fubuki and Aiga who will enter special training. He is Kit. Valt teammate, one of the top Braders representing BC Sol. Kit is interested in Achilles brings out Aiga to the guide and goes around two places to memorize Valt. Following the footsteps of the growth of Valt and looking back at himself as a blader I will swear a battle with a soul into the game against Hearts! Kit Lopez is back in season 3. I remember he is only a little kid at the beginning of season 2 and always stick with Valt as a cheerer. (Dec. 17, 2018 3:30 PM)~Mana~ Wrote: I know what you're saying, but I still disagree; Achilles breaking resolved nothing. It swapped Aiga's approach towards his battles, but his resentment towards Phi and Hearts hasn't changed and was never resolved. That makes a lot of sense so Aiga no longer get those twitches from enemy beys. Interesting, will he still have dark aura because of Phi? Also, Cho-Z Achilles was made & covered in the same episode as Lost Longinus and Spriggan Requiem. Since all starters in December (yet) are the main antagonist beys, does that mean Aiga is the true bad guy in ChoZ? Then what's the point of Shu mentoring Aiga, and why giving him the main role as the protagonist? This doesn't make sense to me. Maybe it's me stretching it too far. Well here is the thing. The December release is tied to a "villain" this villain was Achilles, or the dark power awakened inside it, not Aiga. As Achilles is reborn the current "main villain" is defeated. One thing that Aiga, Shu, and Lui have in common, other than a December release, is that they are (relatively) good people that happened to be the main point of conflict. In season 2 Shu was on a rampage in the God cup. Lui was a rival that only fought Valt once. In season 3 Aiga was fueled by dark power until Achilles was reborn. Shu acted as a mentor to both Aiga and fubuki. Lui is a rival. None of them are truly a villain they were corrupted. For Lui, his ego. He was Japan's best, he will and did go all out to keep that title. For Shu, it was hatred of loosing. he let his bey control him to win at any cost. For Aiga, it was dark power. By using this power awakened in Achilles he lost track of what beyblading is all about. Because of this he was almost consumed. If it wasn't for Phi, killing the monster he created, breaking Achilles Aiga could and would have become the villain. PHI is the villian of super z from the very beginning . if aichelles would not have broken phi still would have remained the big villian . And his character makes him the most remarkable and evil and perfect "villian" of the whole burst series . Who will be the owner of Dead Phoenix ??? If black revive phoenix is so strong then what is the need for a new bey ? 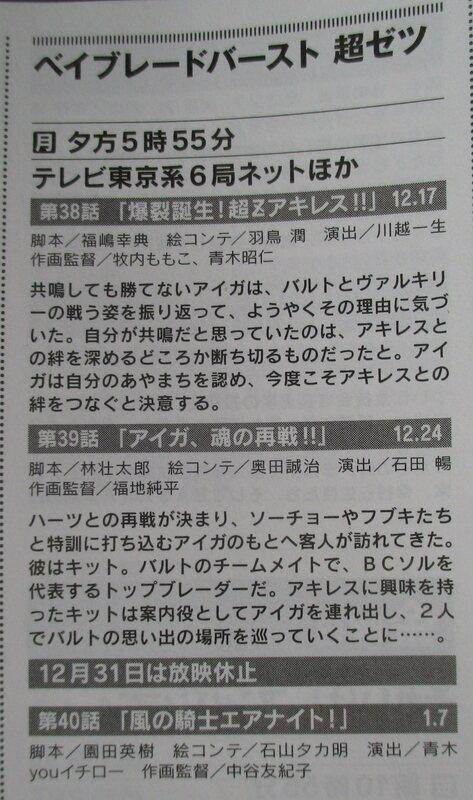 Does it mean that black revive phoenix will be defeated in the next 3 or 4 episodes cause Dead Phoenix will be released in january ? The only reason i see to release Dead Phoenix is that black revive phoenix is not the final challenge in Turbo !!! The final battle is probably going to be Valt and Cho-Z Valkyrie.